Across the street from Fresh Fields is the Philadelphia Human Services building. It backs up on Benjamin Franklin Parkway, "a wide, tree-lined thoroughfare studded with palace-like Neo-Classical structures, flags, statues, and ornamental fountains ... designed to imitate Paris's Avenue des Champs-Elysees" (ACCESS Philadelphia, 1996). 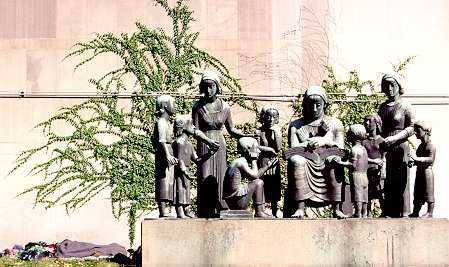 Behind the Philadelphia Human Services building is a sculpture which reflects it's motto, "Our Children Are The Future", and which is appropriate to the thoroughfare. On an autumn day, before the snows set in, at least one person calls this statue home.